The Lenton Centre is situated in an area called New Lenton, better known to many as Lenton. It is an inner-city area one mile south-west of Nottingham city centre, but it only became part of the city in 1877. Before that it was a small village, quite separate from the Borough of Nottingham. The original village was largely confined to the Gregory Street area and until the nineteenth century many of its inhabitants were employed in some aspect of farming. Most of the surrounding land would have been farm land, including the spot where The Lenton Centre presently stands. From about 1750 onwards the population of Nottingham began to increase rapidly. It is calculated that there were about 11,000 people living in the city in 1750, but by 1801 the figure was nearly 29,000. All these extra people needed somewhere to live and places to work, so it was not long before all the suitable land within the city itself had been built upon. Unable to find sites in Nottingham, people began to buy land in the surrounding villages of Sneinton, Basford, Radford and Lenton, each of which was surrounded by farm land.The green light for the development of New Lenton was the sale by John Wright of Lenton Hall which included some sixteen acres of land. This is the site which presently houses the Willoughby Street flats complex and the Community Centre itself. By 1861 New Lenton had evolved into a set of inter-linked streets feeding into Willoughby Street, which in turn led on to Derby Road. To the east, the area between New Lenton and The Park had become a complex of garden allotments known as Allenfield Gardens. To the west of New Lenton it was still fields until you reached the Nottingham and Mansfield railway line, which had been built in the late 1840s. Between 1801 and 1871, Lenton’s population increased from 893 to 6,315, a seven-fold increase. In 1877, Lenton became part of Nottingham and the construction of Lenton Boulevard began in 1884. This was a way of not just creating a low level route into Nottingham for carriers and travellers (remember, this was in the days before cars), but a way of linking the two places together. Lenton Recreation Ground also opened in 1888. The heart of New Lenton will always be Willoughby Street. Most of the houses back then were small, built in terraces and with little more than a backyard. Those who lived in the back-to-back houses on Park Street and Kyte Street did not even have a backyard they could call their own. The city of Nottingham saw the opening of its first public baths in 1850, on the site that presently houses the existing Victoria Leisure Centre. Besides a swimming pool there were a number of slipper baths which patrons hired for the purposes of washing themselves. It was the lure of amenities such as these, promised for their areas, that persuaded the residents of the surrounding villages to agree to their incorporation into the extended borough of Nottingham in 1877. Lenton finally got its baths in 1931. Opened by the Lord Mayor on 5th November 1931, the Lenton Cottage Baths consisted of a washhouse and slipper baths and cost the City Council £17,000. The washhouse had sufficient facilities to enable 24 people at any one time to wash, dry and, should they wish to, iron their clothes. An innovation, not yet available elsewhere, were two washing machines which could be hired by the hour. The two sets of slipper baths comprised 12 for men and 8 for women. The building which housed all this is the one which still stands today. The entrance to the Community Centre once led to the men’s slipper baths. Next door was the washhouse and the entrance to the ladies’ slipper baths. 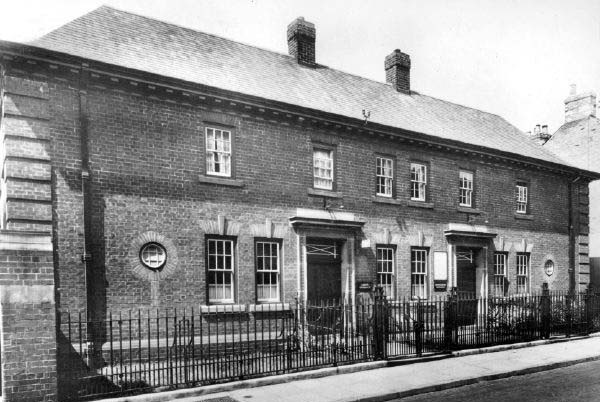 It was recognised that there was sufficient land available at the rear of the Lenton Cottage Baths to enable a swimming pool to be added to the complex. Mention of this fact would periodically appear in the annual reports of the Public Baths Committee, but the plan only came to fruition in the 1960s. This was when William Olds generously offered to meet half the cost of building a small pool which could be used by school children and youth organisations. The City Council accepted this offer and agreed to build this pool at the rear of the Lenton Baths. The William Olds Trust Swimming Pool, built at a cost of £26,424, opened on 9th December 1966. By the late 1950s it was clear that the days of the Willoughby Street area were numbered. The City Council was eager to demolish all the old properties and completely redevelop the area. Compulsory purchase orders were subsequently obtained and residents were offered council houses or flats elsewhere in the city. In the early 1960s, work on clearing the area commenced. The initial plan envisaged a widened Willoughby Street with tower blocks situated along its entire length. Because test borings at the lower end of the street revealed that the rock structure was inadequate to support tall blocks of flats, the plan had to be altered, hence the houses between Church Square and Park Road (since demolished). As more local homes acquired their own baths, the demand for slipper baths diminished and in the late 1970s the City Council reduced the number of them. After being lobbied by the Willoughby Tenants’ Association, the City Council agreed that the portion of the building used for the men’s slipper baths would be converted into a community centre. As a result, the Lenton Community Association was founded to manage the new community centre, which was opened on 3rd February 1979. In 1983 a storeroom and slipper bath were converted into a main hall and meeting room respectively. In 1997, the Lenton Community Association decided that it would like to enlarge the meeting areas and to improve access for wheelchair users and pushchairs. The Association then set about raising the estimated £57,500 needed to carry out the work, which it did in the form of a Lottery Grant of £28,750 and match-funding from numerous charities. By the time the extended and re-furbished centre opened in February 2000, the cost had risen to £80,000 and Nottingham City Council provided additional grants totalling £22,500. In 2004, just as the Lenton Community Association was celebrating its 25th anniversary, Nottingham City Council decided to close down Lenton Leisure Centre, which comprised of the swimming pool and gym. They had previously attempted to close them in 1994 and 1999, but had changed their minds on each occasion in the face of fierce local opposition led by members of Lenton Community Association. In 2004, however, they ignored local opinion and went ahead with closing the leisure centre. The Association, with the support of others in the local community, decided to make a bid to take over the management of the entire building (something they had first suggested in 1994) and raised the money to produce a business plan. In 2005, the Association transferred all its assets to The Lenton Centre, who then bought the building, including the swimming pool from the City Council for £10. The gym was re-opened within weeks, but it took until 2008 to re-open the swimming pool. Historical research provided by Robert Howard.